As a continuation from my last post, lets look at a single handed fly rods designed-built for streamers, such as that I use for Pike and Streamers. Though these fly lines are larger than those associated with trout, like trout lines, the fly line diameters (ranging from 0.052″ to 0.070″) are smaller than any guide. But unlike a trout line, the need to pass a thick junction associated with multi-tip lines and shooting head will often be a frequent event, id est during a cast setup or in the moment of trying to land the fish. 7 to 9 wt Traditional Fly Rod: Hopkins and Holloway Size 1 minimum (at the top). Alternative in Single Foot: Fuji TLSG 8 or REC Recoil Size 2 (at the top). 5 to 6 wt Traditional Fly Rod: Snake Brand Size 1 maximum (at the top). 3 to 4 wt Traditional Fly Rod: Snake Brand Size 1/0 maximum (at the top). European Nymph Rod: REC Recoil Single Foot Size 2 (at the top). Also exploring Hopkins Hooloway Single Foot. As far as Spey Lines, the line diameters range from 0.084″ (SGS Trouter 324 gr) to 0.103″ (Airflo 570gr Skagit). But again, it is the junctions that drives the need given the use of shooting head, running lines and multi-tips. What is the heaviest junction in my collection? 0.190″on a Airflo Delta Spey Long, 9-10 Multi-Tip. 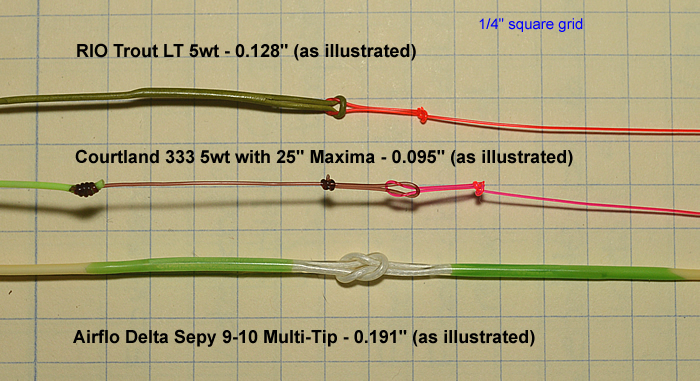 This being the case, what would I plan on using the following guides on a spey rod. Whats next? How do my new standards compare to some production rods that I have in-house. Last why am I doing this? Answer: the lack of a singular unified “driver” from rod manufacturers, guide suppliers and builders has resulted in some diverse recommendations and me trying to define what is right (or best). I think this diversity illustrates there are many good answers, a few bad ones and maybe an occassional excellent answer. So, I need to spend some time to decide what I believe is right – by collecting some hard data and thinking about it. In this way, I am consistent for a reason I can understand and articulate – I want a light guide that will not inhibit the use of the backing, line and leader. In earlier postings, I documented my understanding of the static weight of affixed guides on a fly rod blank (top) and determine there was a point of diminishing returns. Also after some experiments, I have decided to move away from the 90’s wisdom that larger guides are better for shooting line and created a baseline for guide size selection. I continue reading and came across a couple of articles-discussions from one of the old masters – Tom Morgan – who advocates for the smallest guide possible – weight saving and better directional control (reduce wobble-vibration) on the cast. On the Snake Brand’s website Tom recommendations were finer than mine. Having never seen a guide fail, I asked when is a guide to small? My answer became, when it is too small to “freely” pass a line. It was noted the thickest lines were Wulff TT and Airflo 40+ Tapers (no surprise). 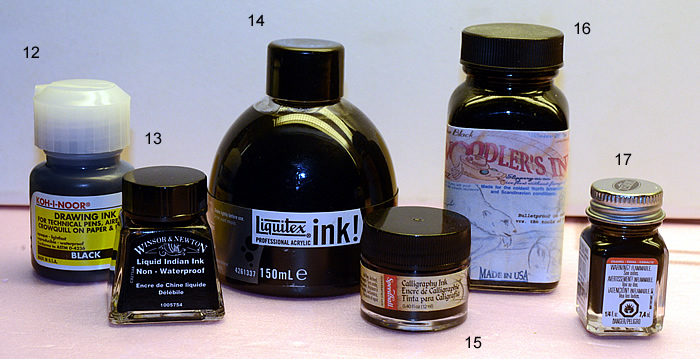 Silk Lines are reported to be finer. Given all these diameters are much smaller than any snake guide, there is no such thing as too small of a guide for a traditional trout rod! The only consideration-exception is some European Nymphing Technicques, such as the French Leader, were the leader to line connection is often in the guides, so here we need to consider the impact of junction. Maxima Chameleon 25 lb Mail Knot onto to a fly line with a prefection loop f0r the leader. The resulting maximum diameter being 0.090″ to 0.100″ – matching or better than the best OEM Loop (a RIO Trout LT 5 over 0.100″). 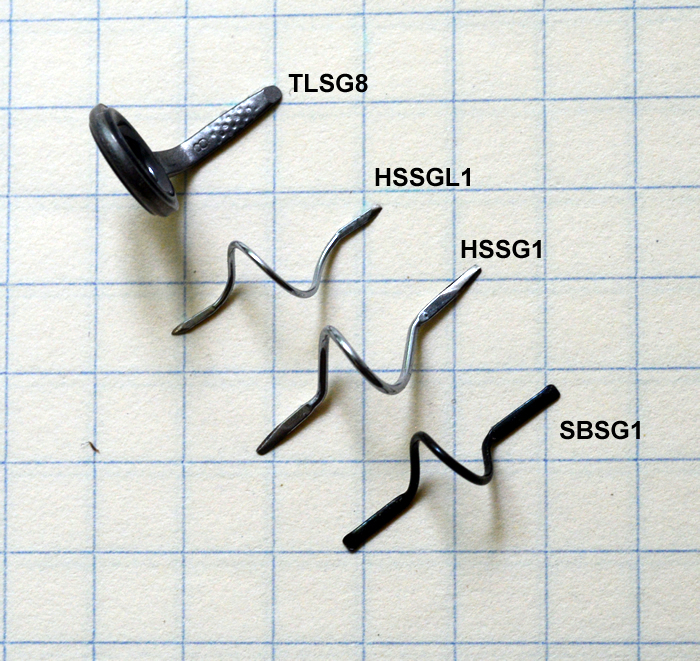 If you are trying to pass OEM loops, be prepared loops as large as 0.150″ on a trout line. If the OEM loop is bulky (greater than 0.150″) replace with the aforemention nail knot 25lb Maxima Chameleon loop. Sidebar, I was once advised to use Mason Hard 30lb for this connection, but I found it too stiff, in that it harm the even energy transfer from line to leader and tied bulky nail knots. After some experimentation and casting, I settle on Maxima’s 25 lb Chameleon to transition from line to leader. How does the opinions of Tom, my measurements and reflection influence my line guide selection (at the top)? 3wt & 4wt Traditional Fly Rod: Use Size 1/0 Snake Brand Guides. 5wt & 6wt Traditional Fly Rod: Use Size 1 Snake Brand Guides. An European Nymph Rod: REC Single Foot Recoil – Size 2. Also exploring the Hopkins Holloway Single Foot Guides to. And if I (you) fancy a finer rod, then go one size down! But for now, I will keep a little more space to pass through the leader knots. Some guide inner diameters to help me reaffirmed matching “line size” to the guide. Please note the measurements were not with the best tools (to counter the twist), so my estimated accuracy is +- 0.01″. And yes, Snake Brand Guides are smaller. 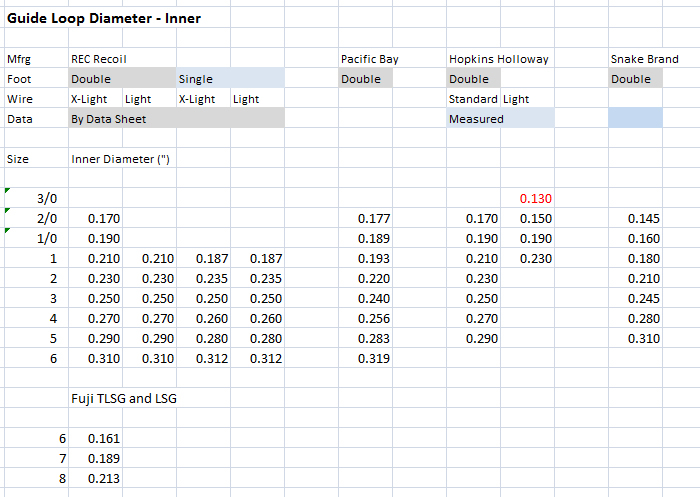 Next posting(s), measurements as it pertains to Bass, Pike and Spey Rods. ultralight rod where flexibility is important, use REC RSF2 on the top section. Example would be a 3wt 10′ nymph rod and will note this is how Grey (of Hardy) builds their light nymph rods to. a traditional 4-5 wt trout rod, such as a Bamboo 4wt 7’6″, use Snake Brand Guide Size 1 on the top. 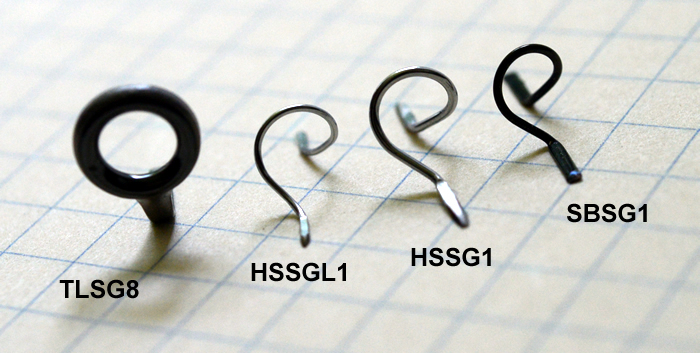 for 3wt or lighter, consider Hopkins and Hollway Light Series, such as HSSGL1 or a 1/0 Guide. remember to touch up the feet, so the thread transition from rod onto guide is fine. There will be a same weight savings, but more importantly you are able to reduce the amount of epoxy and stiffening effect that results. a traditional 6wt or greater rod, use Hopkins and Holloway Standard Guide 1 on the top. Example would be G-Loomis GL3 7’wt 9′ for Smallmouth Bass fishing. a 7+wt rod where flexibility (but not necessarily weight) is important, such as a 12’6″ 7wt Spey, consider the Fuji TLSG8 guides. I re-look at some reference material I have collected over the years. Recommendations for bigger guides, lighter guides and many different sizes. I do not think there is “the right answer”, so it is up to what one feels is right. Larger guides are not necessary and once we get to Size 1 the differences in weight are lower in priority. Of greater significance is Single versus Double Foot, placement and selection of flyline. I will post later some additional comparative pictures with the REC single foot guides, but it is time to move on. 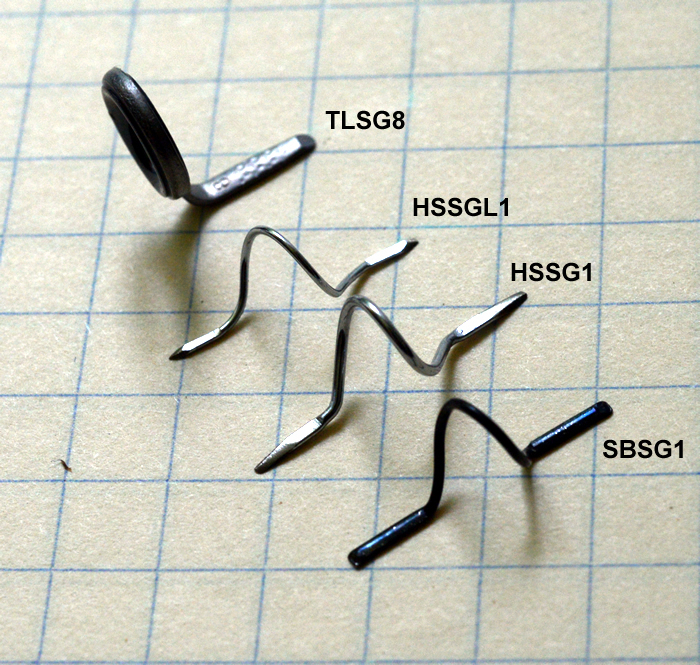 The pictures below illustrate, though the guides all state “Size 1”, the differences in weight are achieved by the obvious – using smaller wire and loops. 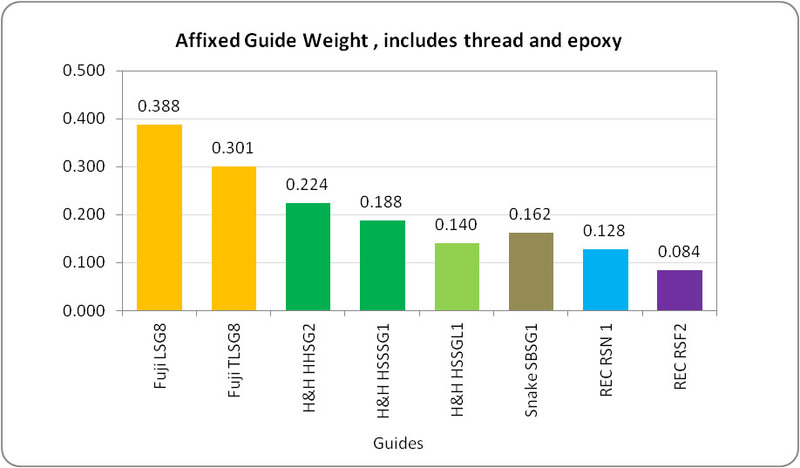 How much does an affixed guide weigh? On a 5″ section to a typical rod top. From this measurements, I also been able to create a model that assumes when all is equal (rod section, size of wrap, et cetera), provide a comparative look of the guides static relationship to a fly rod top. So what is the relationship ….. The HSSG2 is the heaviest guide I would use and reflects the common recommendation in the mid-90s to use larger guides for shooting line (which I no longer agree with). Clearly, the greatest weight is the rod blank (or a fly line), but it s the guide that has the greatest impact. And yes, the colour preserver had no measureable weight. 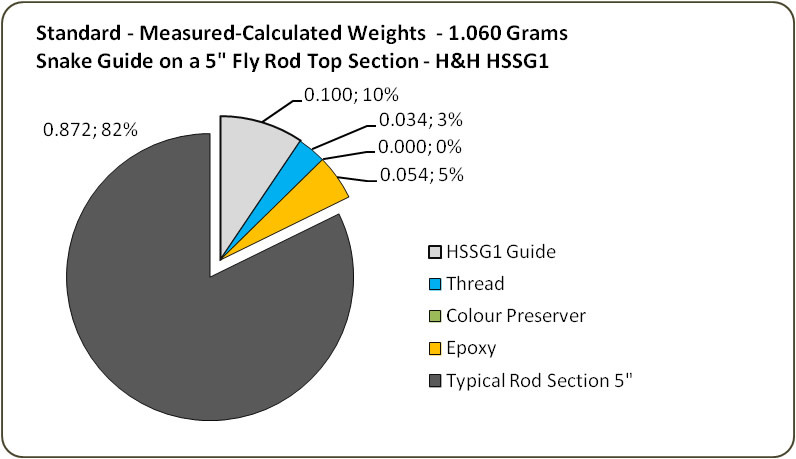 Graph 3 – Using my old standby H&H, but a size reflecting my standards today – HSSG1. Not as obvious in this page, but moving from a Size 2 to Size 1, the guide itself is 25% lighter. 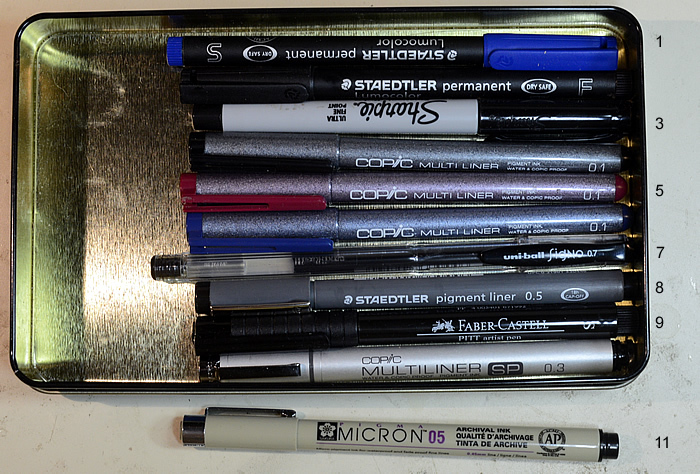 Though, I have to ask, why not a smaller or lighter guide. 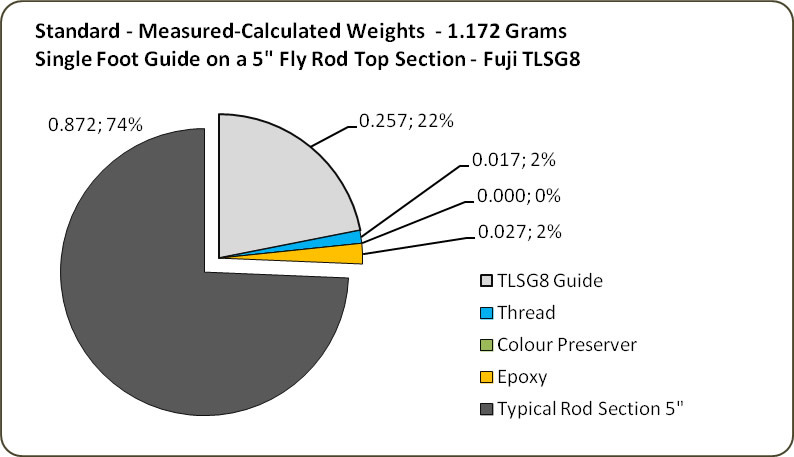 Need to think about this, but I am incline to believe we get to a point where the impact of the guide weight is not as significant relative when we include the fly line (or how the guide is attached -double versus single foot). Graph 4 – Getting lighter – Still with H&H, but using a light Size 1 Guide – HSSGL1. And now we weight of the thread and epoxy exceeds the guide. A good standard for a like double-foot snake guide. Ligther and finer, but if you really want to save weight, eliminate some thread and epoxy and go to a single foot guide. Note from the datasheets from REC, RSN1 has the same loop diameter as RSF2 (and the same weight too). So, if you need the lightest rod, yes, go with the RECoil RSF single foot guides, otherwise, my emerging standard is likely to focus on Snake Brand Guides, Size 1 at the top (or maybe smaller). What about Fuji Ceramics? Nothing wrong with them (as clearly proven on my Sage RPLXi 9wt), but as illustrated below with the light TLSG8, the static impact is higher.